Back in 2002, none of our group had GPS navigational systems yet. And I’m not even sure if they were around at that time. 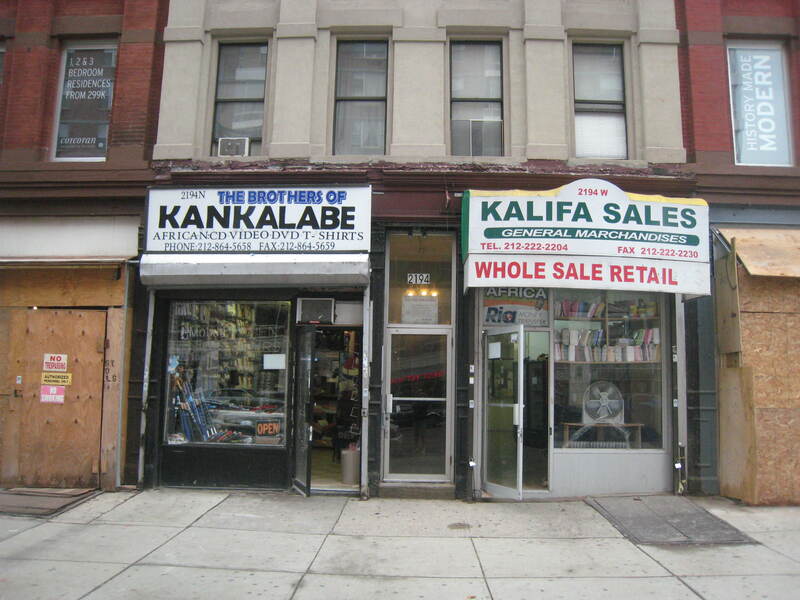 For those who drove, getting to our third destination, an African restaurant in the now bustling, and renamed by real estate prospectors “Gold Coast” of Harlem, was comical. What follows is my depiction of that experience in the spring of 2002. When I arrived at Leworo Dou Gou restaurant, after getting off the B train at 116th Street and walking two blocks up “8th” Avenue to 118th street, I was relieved to see Charlie already at a table and waiting. In fact, he was the only one waiting in the restaurant. Our dinner was scheduled for 7:30. Charlie and I waited, inhaling the pronounced aroma of a fish market mixed in with other strong, yet unfamiliar smells. The aroma, coupled with the fuzzy reception of “Wheel of Fortune” on the restaurant’s television, was beginning to make me feel a bit dubious about this outing, our third of 2002. I glanced at the menu and was relieved to see that none of the “Natural African Dish From the Motherland” were priced above $7. At Leworo Dou Gou we would be very hard pressed to surpass the $20 limit we imposed on ourselves when beginning this venture. The Motherland encompasses a very vast mother of a land, but Leworo Dou Gou claimed to represent the Ivory Coast portion of that continent. Charlie and I were still waiting when my cell phone rang. Zio was close by, searching for Eighth Avenue. I told him to look for Frederick Douglass Boulevard, which on maps and in the phone book goes by the name of Eighth Avenue. A few minutes later, he walked in. So now there were three of us. The smells, which were beginning to test my stomach, immediately enticed Zio. But Zio would salivate at the smell of burnt toast. While we waited for the remaining three in our party, we studied the menu wondering what “dry okra sauce,” “cassava leaf,” and “LaFide” might be. There was also something called “agouti.” The name was familiar and I recalled that I actually tasted agouti on the island of Grenada in the Caribbean. It was in the rodent family and I remember it being very tough and gamey. That not so complimentary description only reinforced Zio’s determination to taste the rat. The three of us continued to wait, we were beginning to worry. The phone rang in the restaurant and a woman behind the take out counter of the restaurant answered. I could hear her struggling, in her English with strong French inflections, to give directions. One of our own was lost. A few minutes later, Rick pulled up. He had been searching for Eighth Avenue. A big mistake, as we were beginning to find out, since there were no street signs proclaiming the street we were on as being Eighth Avenue. After a few more minutes the phone rang again. Again the same woman was attempting to give directions. She gave up and handed the phone to a man who was sitting behind us, the owner, we later learned. 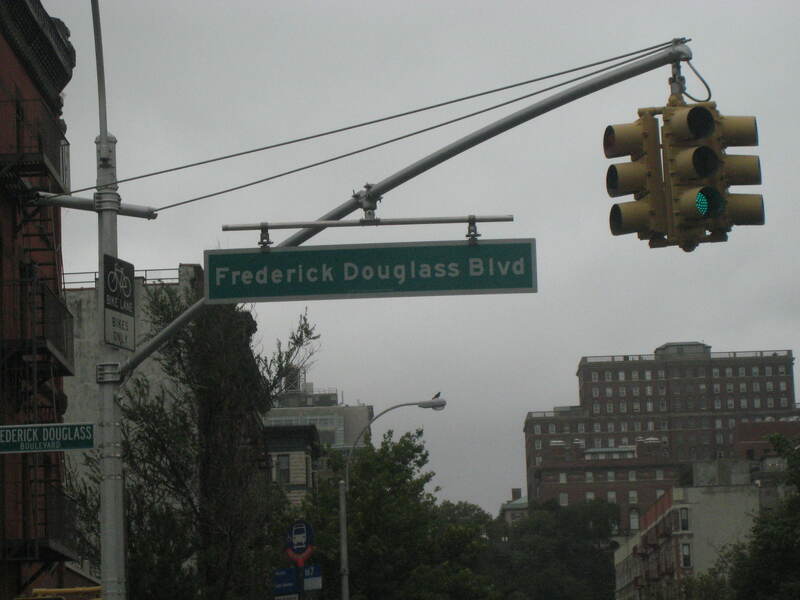 He spoke perfect English and explained, on the phone to whomever he was talking to, that Frederick Douglass Boulevard was Eighth Avenue. He had been, it turned out, talking to Gerry and a few minutes later both he and Eugene walked in. By now, either the smells had mellowed or I was too hungry to notice or care anymore. We all were ready to eat, but we had no clue what to order. We did learn that there was no more grilled fish, and to Zio’s disappointment, no agouti. Rick made the wise choice, he told the waitress to bring six dishes, a combination of some of the different items on the menu. While our food was being prepared we all had homemade ginger beer, tangy with a sharp hint of lime along with the zesty ginger. To entertain us while we drank and ate, the owner switched from the fuzzy network television, to a video of “soukous” music from West Africa, some of which, he claimed he personally photographed while at a concert back in the “motherland.” The music was infectious and the video production, gritty especially the scenes with the dancing midget. Or was he a dwarf? Our food came, one heaping plate at a time. Fried whole fish (croaker) with plantain. Fried whole fish with cassava and yams. Stewed “hard” chicken, grilled chicken and beef on a stick, stewed fish in okra sauce, and an aspic-type wedge of what seemed to be pounded banana, which, by itself was bland, but worked with the sauce from either the stew chicken or fish. We were given forks and knives, but noticed that one of the restaurant’s customers expertly ate his meal without either. Even with forks and knives, our hands got greasy and we made what probably was the unusual request at Leworo Dou Gou for napkins. What we got were sections of paper towels. The six of us soon devoured the food leaving only fish bones and cleanly picked pieces of chicken. Everything else had been eaten with Zio and Gerry even sucking up the last of okra sauce with the remaining few kernels of rice. There was no mention of dessert on the menu and the owner wasn’t offering anything but coffee, so we ended it there. All that for only $12 dollars per person left us wondering how Leworo Dou Gou could stay in business. Leworo Dou Gou did not stay in business for long. Within a few months of our visit it was gone. But that’s not uncommon among the African restaurants around the area of West 116th Street known as “Little Senegal.” They come and go with great frequency. Though as the neighborhood changes and rents increase, I wonder how long the African influence in the area will remain. In 2002 there were vacant lots and tenements surroiunding Leworo Dou Gou. Now, across the street from where Leworo Dou Gou was there is a market price condo with a Chase bank, Starbucks, and a gourmet supermarket. A few blocks up an Aloft Hotel ( a divison of W Hotels) will soon open while new restaurants are so prevelant on Frederick Douglass Blvd that some are saying the street will become Harlem’s “Restaurant Row.” But will they qualify for our $20 and under crowd?